From the start Schnitzer West, LLC based their business on rethinking property development and management from a tenants’ perspective, and it worked. Schnitzer West is now one of the leading real estate developers & managers on the West Coast. It’s no surprise a company like Schnitzer West turned to F5’s BIG-IP technology to offer that same forward thinking to their internal clients. Given the opportunity to refresh, Schnitzer West wanted to make their environment more resilient to failures and “location aware”. They host applications in two data centers, but the old firepass was single homed in only one of the data centers. Aside from being susceptible to site outages, the single location firepass also forced any external users who needed to access application in the data center without the firepass to run over a VPN connection to the second data center. A highly available setup where external users were protected against a site failure and directed to a site based on application location was ideal. Schnitzer West didn’t know if this was possible, until we started discussing what F5 has been up to with the BIG-IP APM module. WorldTech IT designed a solution around F5’s BIG-IP Local Traffic Manager (LTM), Application Policy Manager (APM), and the Global Traffic Manager (GTM – now known as DNS), deploying the new F5 BIG-IP’s in both data centers. The client was happy to learn F5 offers a Virtual Edition of the F5 BIG-IP. This allowed Schnitzer to deploy their solution quickly as a Virtual Machine, while utilizing hypervisor hardware they already owned. The F5 Virtual Edition platform also gave Schnitzer West the flexibility to scale, as it’s a simple license upgrade to add more bandwidth or modules. The BIG-IP platform also gave Schnitzer West the ability to scale. They didn’t have the need for a Web Application Firewall (WAF), or a traditional portbased firewall, but in the future when they do – it’s just a license upgrade to enable the ASM or AFM on the BIG-IP. Classic SSL VPN Network Access to their admin users. Portal Access to key web applications for corporate and vendor users. A single point of failure within a single location. When the Corporate ISP goes down, remote users no longer have access to internal resources. Individual User IDs are managed locally within the Firepass. Users applications are located in both data centers. To access any applications in the second data center, users are required to access the first data center, then access the second data center over a VPN connection with latency. Users in the branch offices need to access their windows desktops via RDP after hours remotely. Some of the branch offices have better connectivity to the second DC. To address the first issue, Schnitzer deployed a F5 BIG-IP Virtual Edition in their second data center. The F5 Virtual Edition gave Schnitzer the ability to deploy the F5 BIG-IP quickly, while utilizing hardware they already owned. The Virtual Edition platform also gave Schnitzer the flexibility to scale, as licenses are based on bandwidth. Two Active-Active locations required the use of the F5 DNS/GTM (Global Traffic Manager) module to distribute DNS requests between the two sites, while providing persistence. Unfortunately, purchasing the F5 DNS/GTM add-on license was out of budget. Fortunately, WorldTech IT offers a SaaS Global Load Balancing Solution powered by the F5 DNS/GTM, for situations just like this. To alleviate the second issue, WorldTech IT moved authentication of all remote users to their Active Directory database – where it belongs – away from the local database that was on the legacy F5 Firepass. To achieve the user and OU-based entitlement mapping, the Firepass requires that you manage individual user IDs within its’ database—it doesn’t have the ability to query Windows AD for a user’s entitlements. Fortunately, the F5 BIG-IP APM (Access Policy Manager) can query for user’s entitlements from AD without the cumbersome effort of managing users in two locations. As you would imagine, Schnitzer West was excited to relieve themselves of managing users in two locations. The old way required constant updates to Firepass whenever users joined, departed and re-joined from the company, in addition to updating their centralized AD user database. Users should login to their applications and remote desktops through the first data center, unless their applications or work location has optimal connectivity to data center two, in which case they need to access the second data center first. All users utilizing VPN should login via the second data center, regardless of their work-location or which data center they arrive at initially. If data center one or two goes down, all users should be able to access all resources from the available data center. The client organizes their users within Active Directory (AD) using AD Organization Units by office building. The diagram below illustrates the traffic flow of a user that happens to login to the APM Webtop within the second data center, but their OU contains a building location whose optimal path is via the data center one. To achieve this on-the-fly routing, WorldTech IT setup each BIG-IP as both a SAML Identity Provider (iDP) and Service Provider (SP), with iDP initiated connections. The user types in their short URL just like they normally would to access the old firepass portal – remote.acme.com. But now, unknown to the end user, that is a cname that points to the WorldTech IT WideIP – www.acme.gslbdomain.com. If the user is initially directed to data center two, the APM presents a login page for authentication. Once authenticated, the APM performs a check to ensure the remote Hosting location is available. If it is down, the APM presents the full set of entitled resources to the users as non-SAML resources. If the Hosting site is up, the APM performs an AD query for the list of remote desktops the user is entitled to access, and displays them as SAML links. The user is unaware the remote desktop is a remote SAML resource. 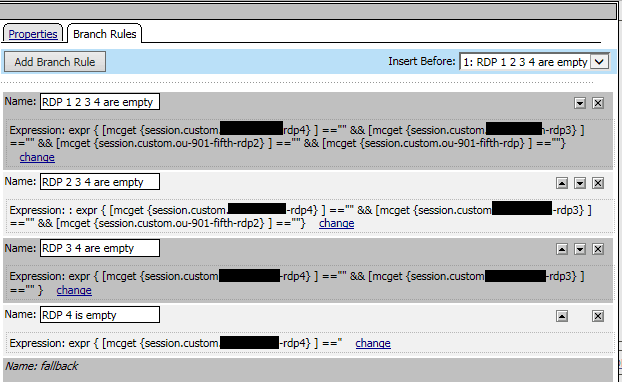 When the user clicks the link, the Hosting iDP generates a SAML assertion as a POST message to the Hosting SP. The SAML assertion contains the Referrer Header, which contains the requested SAML resource. On data center two , the SAML SP receives the assertion and responds back to the iDP with an authentication request for the requested token. If the authentication passes, the APM uses an an iRule to obtain the SAML resource name from the Referrer header and stores it in custom APM session variable. WorldTech IT provided the client the ability to provision up to 4 per user and 4 per building RDP remote desktop resources. 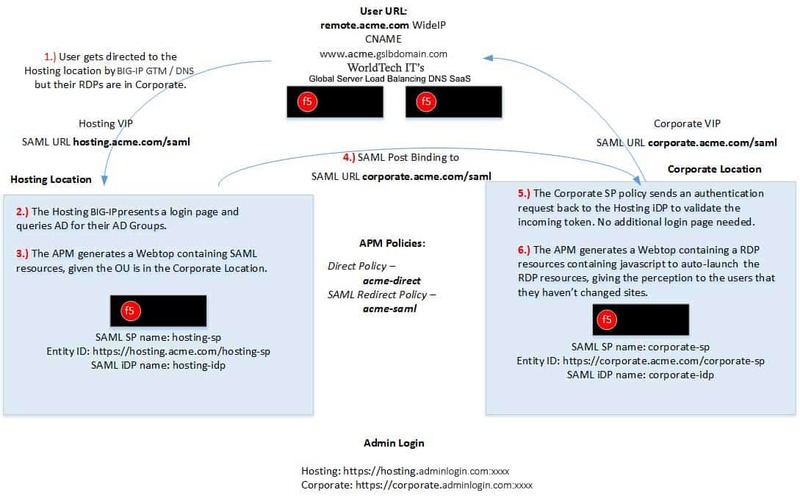 To conditionally display an RDP or SAML resource depending on whether the attribute was populated or not in AD, and avoid displaying resources with empty links, WorldTech IT developed a custom Visual Policy Editor (VPE) Macro. The macro checks for the existence of the attribute in the user session variable and will only conditionally display RDPs based on the existence of user AD attributes. You can also use the Advanced resource assign Action to add the appropriate resource to the webtop. We hope this case study shows you just how flexible the BIG-IP platform can be. What is SNAT in F5 Load Balancing? SNAT vs. Inline. What is a NAT?